April 11, 2018, 9:19 a.m.
By Shan Wang @shansquared April 11, 2018, 9:19 a.m.
For people interested in a no-frills way to spin up a new personal newsletter, there are more alternatives to Mailchimp-TinyLetter than ever. 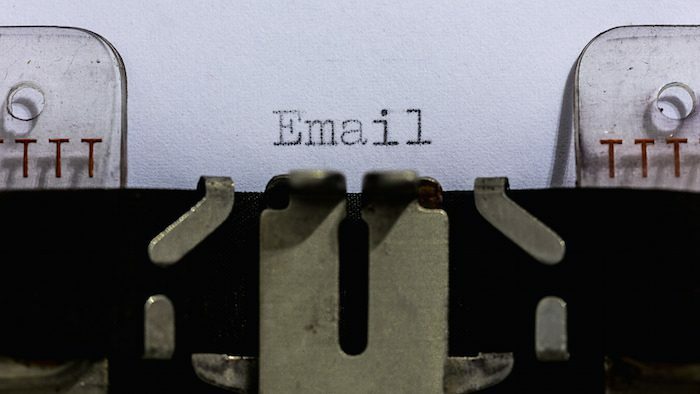 Prominent newcomers like U.S. startup Substack or the Netherlands-based Revue have focused on simplifying writing tools and streamlining software for the entire newsletter management process, from writing to sending to maintaining the subscriber list to handling paid memberships. 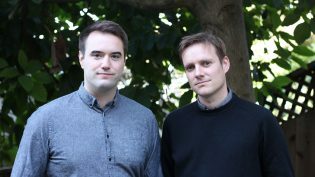 Revue, co-founded by Martijn de Kuijper and Mohamed El Maslouhi, pitches an easy-to-use authoring interface (the company suggested Medium or Tumblr as reference points), with many small but useful additional features like video embeds or Facebook content integrations, all developed together with or as requests from its users. It’s a service centered entirely around longer, editorial newsletter writing, so significant work went into template design and email readability. The tiny team handles all technical issues and feature requests itself. There’s also some language flexibility: the profile page for readers who’ve signed up is translated into 10 languages. For those benefits, Revue charges individual writers based on the total number of emails they send out, starting at a rate of $5 per month (users with fewer than 50 subscribers can send emails for free). As of last year, it began offering a publisher plan, used by which allows for multiple newsletters, multiple team members and roles, and approval workflow (custom pricing, starting at a base of $2,000 a year). The company is currently three people (de Kuijper, El Maslouhi, and Mark Schiefelbein, who is helping Revue grow its user base) and has around 30,000 users on its platform, about 2,000 of whom are paying to use Revue, according to de Kuijper. Most of these paying users fall into the $5 range, with a couple of hundred subscribers per newsletter. It began as a tech-content-centric service; around 60 or 70 percent of its user base is from the U.S., according to Schiefelbein. 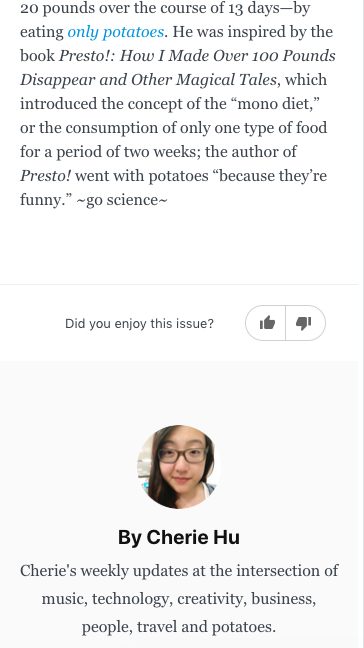 On Thursday, Revue is opening up its subscriptions feature, which it had been testing in private beta with around 50 writers, to anyone using its platform. Interested newsletter authors can set their own rates and mark specific issues of their newsletter as paid or free; non-paying subscribers to a paid newsletter can see the free issues, but paywalled ones will be greyed out for them. 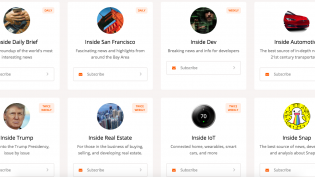 The feature connects to Stripe for payments; Revue takes a 6 percent cut of what the newsletter writer makes. Other features from a laundry list de Kuijper and Schiefelbein touted when we spoke ahead of the launch of the company’s paid newsletter option include an quick, visual way for readers to give feedback at the bottom of each email, a clean Twitter embedding function, integrations that let a newsletter writer link to or pull in content quickly from outside the newsletter, and an easy way to port over Mailchimp subscribers if you’re switching newsletter services. “A year ago the whole idea of a newsletter was pretty novel to me, so there was a lot of trial and error. When we decided to do a newsletter we did very thorough research. We had several platforms to choose from, but Revue seemed to give the best value,” Arjen van der Horst, a reporter at a Dutch public broadcaster who writes a weekly summary of goings-on in Trumpland, wrote to me in an email. 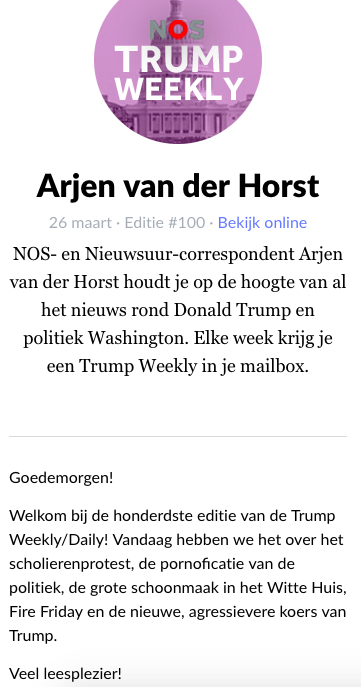 Van der Horst began writing it as a personal project and a resource for other Dutch reporters looking to catch up on the firehose of Donald Trump–related news, but his organization adopted the project formally and began paying for it (“Back then our pricing only went up to 10,000 subscribers, and it seemed like almost daily they were emailing me, ‘hey, we need more,'” de Kuijper told me). The Trump Weekly newsletter, still written and sent by van der Horst directly, is up to 33,453 subscribers. Casey Newton, Silicon Valley editor at The Verge, came across Revue via ProductHunt, noting that it emphasized editorial features, not marketing ones. 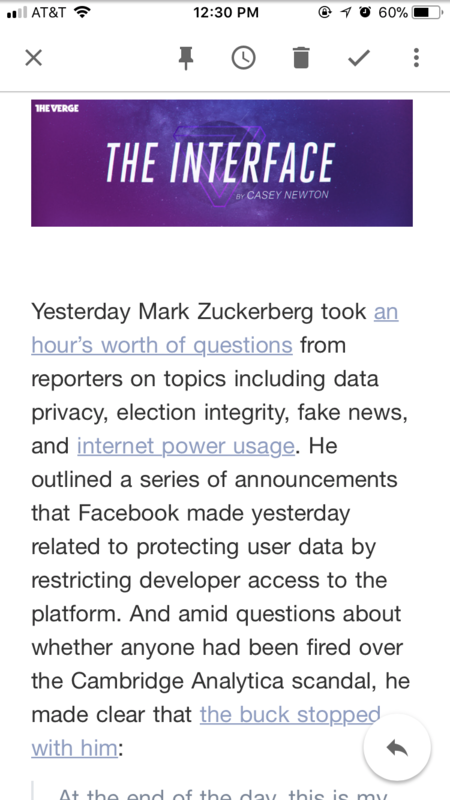 His newsletter, The Interface, is up to 2,884 subscribers. “We have a whole long list of other features we want to implement and obviously a lot of other requests, which are mainly around customization, integrations, and analytics: people want to have more data, they want to integrate with, for instance, Google Analytics,” de Kuijper told me. 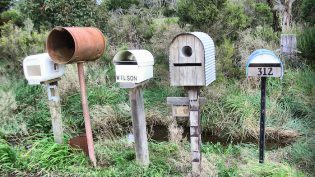 Subscriber management tools in the pipeline include features to help newsletter owners handle subscribers who haven’t opened any emails for several issues. Revue raised around €300,000 (USD $369,345) toward the end of 2016, and is aiming to break even by this summer, Schiefelbein said. He hopes to see around 50 percent of Revue’s revenues by the end of the year coming from larger publisher accounts. The paid newsletter offering will add a small but new revenue source for the company. What about custom support from Revue for advertising? POSTED April 11, 2018, 9:19 a.m.
Wang, Shan. "The Dutch newsletter platform Revue, with around 30,000 users, is opening up subscription features." Nieman Journalism Lab. Nieman Foundation for Journalism at Harvard, 11 Apr. 2018. Web. 22 Apr. 2019. Wang, Shan. "The Dutch newsletter platform Revue, with around 30,000 users, is opening up subscription features." Nieman Journalism Lab. Last modified April 11, 2018. Accessed April 22, 2019. https://www.niemanlab.org/2018/04/the-dutch-newsletter-platform-revue-with-around-30000-users-is-opening-up-subscription-features/.